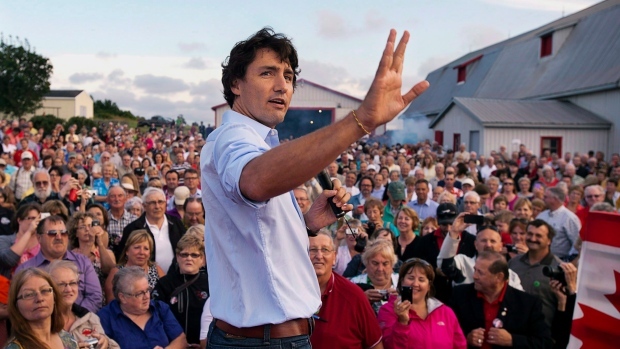 Bowalley Road: Here Comes The Sun: Justin Trudeau Changes Canada's Political Climate. Rejecting The TPP Could Help Labour Win In 2017. Is Australia Sending Us A Message? Here Comes The Sun: Justin Trudeau Changes Canada's Political Climate. “SUNNY WAYS, my friends, sunny ways.” The rest of the world may have struggled to grasp the meaning of Justin Trudeau’s words, but Canadians knew exactly what he meant. Canada’s new prime minister was beginning his victory speech by quoting an old one – the highly successful Wilfrid Laurier (1841-1919). In the Aesop’s Fable, from which Laurier drew his catch-phrase, the North Wind and the Sun compete to remove the cloak from a passing traveller’s back. The freezing breath of the North Wind strips the leaves from the trees, but the traveller wraps his cloak ever-more-tightly around his body. Defeated, the North Wind makes way for the Sun, who beams down upon the traveller with radiant good will. The North Wind’s chill is replaced by shimmering summer heat. Overjoyed, the traveller casts aside his cloak. “If I were in power, I’d try the sunny way”, said Laurier. And he was as good as his word, choosing persuasion and positivity, over force and negativity, on every possible occasion during the 15 years (1896-1911) he served as Canada’s Prime Minister. But the 43-year-old son of Pierre Trudeau (Prime Minister of Canada from 1968 until 1984) wasn’t content to draw rhetorical inspiration from Canadian leaders alone, his superb victory speech went on to borrow from President Abraham Lincoln’s first inaugural address. And what a win it was! The Liberal Party began the campaign holding just 34 seats in the Canadian House of Commons. By the end of election day, 19 October, the Liberals had won 184 seats – ten clear of the number needed to govern the country on their own. Lazarus would’ve been proud! How did they do it? How did they rise from third party status to overhaul the left-wing New Democrat Party (NDP) Opposition, which the early run of opinion polls had identified as the front-runner? And, how did Justin Trudeau do it? An MP for just seven years, and leader of the Liberals for less than three years, how did a 43-year-old schoolteacher unseat an incumbent Prime Minister and dash the hopes of his NDP rival, Leader of the Opposition, Thomas Mulcair? First and foremost, Justin Trudeau won because he was … Justin Trudeau. As the son of one of Canada’s most popular prime ministers, Pierre Trudeau (1919-2000) he was always going to be talked about as a prospective prime minister. Such expectations do, of course, have their downside. Still, instant name recognition across the entire electorate is a pretty hefty advantage with which to begin one’s political career. He also had the advantage of growing up in an intensely political environment: absorbing, from an early age, the abstruse rules of the political game; the unique political culture of his father’s Liberal Party; and the intoxicating fumes of dynastic expectation. As if these advantages were insufficient to set him apart from his political competitors, Trudeau is also highly intelligent and blessed with a film-star’s good looks. In 2005 he married Sophie Grégorie – a prominent Canadian TV celebrity journalist – and in short order they produced three, equally telegenic, children. These sort of things shouldn’t matter – but, of course, they do. Right from the start Justin, Sophie and the little Trudeaus looked like Canada’s First-Family-In-Waiting – straight out of Central Casting! And yet, even with a great name, a lifetime spent in and around politics, a celebrity wife and three gorgeous kids, a politician still has to possess, in his own right, the attributes and instincts of an effective leader. Perhaps the greatest of these attributes is political courage: the capacity to do what others would dare not do, and to stick with his choices – no matter how fierce the criticism. He must also be able to read the political terrain. To see a way of reaching his objectives that his own choices, and the choices of others, have opened up. The other attribute a politician needs is an acute sense of timing: of knowing, like Kenny Rogers’ Gambler, when to hold onto your cards; fold-up your hand; walk away from the table; and run for the nearest exit. All that – and luck. Lots of luck. Like the NDP Leader, Thomas Mulcair, believing that he had to prove the NDP was ready for office by coming out in favour of a balanced budget. Trudeau immediately saw that, by tacking to the right, the NDP had opened up a vast swathe of political terrain to its left. Already convinced that the politics of austerity was a dead-end street, the Liberal Leader courageously abandoned conventional wisdom and declared that his government would rescue Canada’s faltering economy – not by reducing expenditure, but by stimulating it through job-creating infrastructure projects. If the NDP was willing to line up alongside Stephen Harper, then the Liberals were only too happy to channel the spirit of John Maynard Keynes! And he did it all with a winning smile and an unrelentingly positive demeanour. He sensed that Canada’s patience with Mr North Wind’s vicious flurries towards war and religious intolerance; his squalls of fiscal and social conservatism; had come to an end. The young Liberal leader with the famous name was convinced that, more than anything, Canadians were hoping for a change in the weather. So that is what he gave them. His “sunny ways” broke up the ice of Harper’s endless winter. The wind dropped away. The sun came out. And the electorate’s doubts about the Liberal Party were cast aside – like a cloak they no longer needed. This essay was originally posted on The Daily Blog of Wednesday, 21 October 2015. According to Vox, the niqab issue hurt the third-party in Québec, where they tend to be intensely secular, and turned anti-Harper voters to Trudeau. Seems a bit simplistic, but an interesting take. Personally I think people just got tired of austerity coupled with fundamentalist religion. Canadians tend to take their social/collective responsibilities quite seriously. And Canada was turning into a "not nice" place :-). Justin Trudeau PM – The former schoolteacher has never been a minister in any Government, never held a portfolio, has promised to raise taxes and to take the country in to deficit to fund infrastructure projects. Michael Joseph Savage -a former brewer, had never been a Minister in any Government, never held a portfolio and promised to raise taxes and use the country's resources to fund infrastructure projects. - Experience and austerity do not equal success. Trudeau was a risk taker, tax-infrastructure-jobs, he knew what he wanted, tax- infrastructure-jobs, he expressed himself well, tax-infrastructure-jobs. He got lucky but many are saying that he made his own luck. We have four people like that in NZ, John key, Shane Jones, Winston Peters and the other is unknown at this stage. My pick at the moment is David Seymour, he is head and shoulders above any-one in the Green and Labour parties and I know that his right-wing conviction could and probably will, in time, go hard centre with a largesse of risk, spend and emphatic communication. Don't laugh, he is capable and people are impressed, including media and political leaders. I do not know him and I do not support Act but I am impressed by him. Page one. Borrow during recessions to spend on public works to stimulate growth. Page two, when growth returns, stop borrowing and repay the debt to balance the books and have options for the next downturn. Never forget page two, when preaching anti austerity. Your piece has an almost religious tone Chris-interesting. Most New Zealanders forget the Canadian federal system - it won't be quite that easy. Above all the Canadians were fed up with Harper -not a great recipe for a new government. Things can change very quickly in their system. Well Brendan, as opposed to Harper, who's never been anything other than a politician, and managed to score Canada a recession in the first quarter of 2015. Could Trudeau do any worse? John Key PM – The former foreign exchange dealer had never been a minister in any Government, never held a portfolio, has promised to not raise taxes but did so anyway and to take the country in to deficit to fund infrastructure projects. Good point Brendan. History clearly shows that quite a lot could go wrong. Perhaps the difference between success and failure is that they serve different masters. I am noting a sense of alarm amongst the rightie wingnuts! Heck, now there is a horrible Leftie School Teacher running Canada! Our resident clairvoyant gazer who claims to know the future, tells us that Corbyn would never make the Leader of the UK Labour and when he did would never win a UK general election. Or that a leftie Liberal would run Canada. The rise of parties like Podemos in Spain alarms them too. That will possibly put Leftie-commie-socialist bums on seats that the righties claim is theirs by right. Trudeau's ideas are the right ones. Borrow or better still print the money to spend on infrastructure and then write off the printed money as the returns come back in. That spreads out into the general economy and the economy grows. Impose Austerity and watch an economy shrink-- spend and watch it grow -- economics 101! A new sort of economics - Practical Economics! Not esoteric economics which doesn't know it's place and tries to reshape philosophical beliefs and the highest reaches of the intellect and soul, to a degraded level that matches those of the perpetrators. Perhaps Canada can now steer clear of those purveying systems to activate pavlovian responses to degrade people into those who worship money and possessions and bourgeoisie social norms. Canada needs to confiscate power tools that create computerised sharemarkets, zero contracts, 24/7 shopping, and industries and an economy based on exporting weapons to inflict injury of all sorts and continual war.